This post is slightly off-topic as it has little or nothing to do with film, or VHS collecting. However, since of late, my posts have been increasingly personal, as they are often about memory, this is therefore fitting. I was somewhat shocked this morning to learn that keyboardist and arranger par excellence Doug Riley died suddenly on Monday while waiting in a plane travelling from Calgary to PEI. He was still young at 62, yet left behind a legacy of music that could fill many lifetimes. Doug had early on earned the monicker of "Dr. Music", a namesake for the band he also created. This supergroup (a veritable who's who of Canadian jazz players), tinged with R&B, gospel, rock and jazz, earned some Top 40 hits in the early 1970's, with "One More Mountain To Climb" and "Sun Goes By". 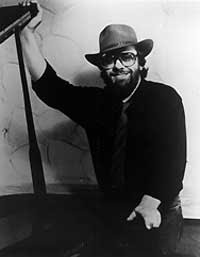 And in addition, Doug was a session player for everyone from the Brecker Brothers to Bob Seger. He also was very busy as an arranger. This tireless wonder could move effortlessly from arranging a classical piece for Placido Domingo to playing the dirtiest blues. For all that, his greatest love was jazz, and Doug was truly one of the masters of the Hammond B3. When Susan and I were first courting, she had taken me to The Orbit Room to see Doug in a trio called "Smoke". And that was it-- we were "Smokeheads". For about six months, we had visited the place quite frequently on Smoke's regular Tuesday night gigs. With Doug on the B3, his son Ben, then 19, on drums (ironically named after another drummer named Ben Riley), and Tim Tickner as the frontman, interspersing his vibes and electronic percussion with beat poetry, free association, and another in a series of political rants, this band was a truly phenomonal, impossibly funky outfit, combining jazz, R&B, beatnik ambience, and whatever else. Their version of BB Gabor's "Simulated Groove" often opened their show (causing "This is a simulated groove, and I'm trying to look happy" to be a catch phrase in our house), and such ditties as "Harry How Your Garden Does Grow", "Sunflower" or "Gunpoint" turned this into the best night out bohemians like us could ever want. Sadly, this outfit never recorded, at least not to my knowledge, as Smoke should have been the next big thing in the local scene. But still, we would end up seeing plenty of Doug Riley about town, often with his B3 Quartet featuring saxman Phil Dwyer as the frontman (on stage, Doug has a very quiet demeanour-- he lets the keys do all the talking), with his old friend Moe Koffman in one of the flautist's final public appearances, and even among the B3 Organ Summit, although Doug was unfairly given less chance to play. On stage, Doug also left an indelible image, usually decked out with dark glasses, a cowboy hat, and ubiquitous cigarette-- a quiet storm who created some of the most sweetest thunder. And despite having worked with a Christmas wish list of talent north and south of the border, he still nonetheless felt happiest playing in Canada's figurative backyard, and our country is all the better for still having this treasure all to ourselves. The legacy of Doug Riley is a true Canadian institution. Since this is after all a film blog, I suppose we should close with this amusing footnote, that Doug Riley also contributed to the history of Canadian cinema, having found time in his busy schedule to compose music for Ivan Reitman's early films Foxy Lady, and -you guessed it- Cannibal Girls. Rest in peace Doug, you're the greatest. Canada seems to have produced a lot of talented people like Doug Riley. He wrote the score for "Cannibal Girls"? Indeed, he has left a mark in Canadian cinema.